There is a growing need for graduates with a grounding in biological sciences who are able to understand the translational new technologies required for new medicine commercialisation. This BSc focuses on the early stage development of new medicines, such as stem cell, new vaccines and potential new therapies related to healthcare. A total of 18 points in three higher level subjects including Biology and Chemistry, with no score below 5. A total of 16 points in three higher level subjects including Biology and Chemistry, with no score below 5. D3,D3,D3 in three Cambridge Pre-U Principal Subjects, including Biology and Chemistry. Successful completion of the WBQ Advanced Skills Challenge Certificate plus 2 GCE A-Levels at grades AAA, including Biology and Chemistry. This flexible programme enables you to choose different options from an approved list, thereby tailoring your degree towards the engineering, biological or business aspects of new medicine development. The department has amongst the most modern and comprehensive biochemical engineering facilities of any university in the world. Valued at over £35 million, they attract leading industrial collaborators. Our teaching is designed to help you work at a detailed analytical level, and also to see the bigger picture in terms of addressing environmental and ethical issues. We have been pioneers in providing our undergraduates with training to help them understand the business environment in which life science industries operate. This prepares you better for your future career. In the first year, you will study the fundamentals of biochemistry and cell biology, which are required to understand the technologies used in early stages of new medicine development. Case studies will look at the challenges of creating new medicines, disease states and the ethical considerations of working in the biopharmaceutical industry. The second year examines the intricate signalling structures within the human body, and looks at the immune memory that new vaccines seek to stimulate. In addition, you will be required to consider the commercialisation of new medicines and will develop your knowledge of intellectual property and how to manage it in a global market. The research project is a core component of the third year, along with modules in business planning and the bioprocessing of new medicines. At least one optional module is offered every year of your programme, enabling you to tailor your degree towards the business side of the new medicines industry or the biomolecular side. You will select 1.0 credit from a range of options. 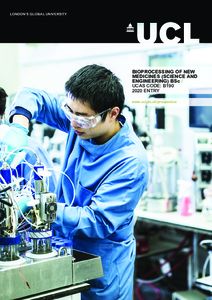 Detailed course descriptions are available on the department website: Bioprocessing of New Medicines (Science and Engineering) BSc. You may be based in a university, or you may work in company research and development activity involved with the design of facilities and creating safe materials. The programme teaches skills in systematic thinking and precise calculation, which leads some graduates to enter the financial sector (particularly those companies that invest in healthcare). In addition to academic requirements, we will also use your application to assess your motivation for studying bioprocessing. We will be seeking applicants committed to studying at the highest level, who are eager and able to rise to the challenges presented both by the programme and by a career in the discipline.